Is your dog pulling on the leash practically pulling your arms out of their sockets? I see people walking their dogs, no their dogs are walking them, the dog pulling them all the way. If you let a dog pull on the leash he will think that is what he is supposed to do and keep doing it. So how do you stop this behavior? First of all if your dog is grown, it might take some time. Ingrained habits take longer to unlearn. If you have more patience than your dog you will eventually be able to train your dog. The key is to be more stubborn, more determined than your dog. And know what to do along the way. If pulling is something you don’t like, then don’t tolerate it even for a second. If your dog is pulling forward, either stop, or quickly turn a different way and say “this way” to get the dog going in a different direction. As he turns there will be a brief moment of slack in the leash. You can tell your dog “that’s right” as this happens. Now that you are headed in a different direction and your dog starts pulling again, quickly turn a different direction and say in a calm but affirmative voice “this way” and your dog will follow. Give an affirmative “that’s right” when there is slack. If you can make this seem like a game for your dog, he will start paying attention to you and begin watching you to see if you are going to change direction. To improve the conditions for you and your dog, giving him a longer time of good behavior and you more time to see what is coming and correct him before he hits the end of the leash ( which could be micro seconds on a six foot leash) use a long line. The long line will give you time to call out a change of direction before he gets to the end of the leash. There is a whole lot more to be gained and more training available with a long line. Some dog trainers specialize in the use of a long line. Whatever method you use to teach your dog to stop pulling on the leash, make sure that you never let your dog do it in the first place, then he’ll never be reinforced for doing something you find unpleasant. 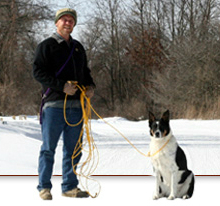 John Spieser is the master of The Long Line Dog Training Method. Get his free audio where he talks about how he uses the long line with dogs and puppies. This will work with your neck strong dog or puppy if you stay consistent. 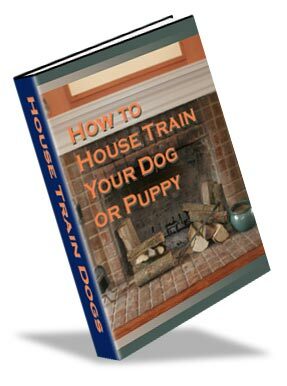 When we first get our new puppy or dog from rescue, we usually want to know what kind of training, if any, the dog knows. Sit is about the very first thing a dog learns so many dogs know this one, even puppies. But as we move through life with our dogs it is very useful for humans to be able to direct the dogs from one place to another. Wouldn’t it be convenient if our dogs could change direction or wait for a few minutes while we made our way to the car, around the block or even in the house? My dog trainer, John Spieser, says that the first two dog training commands he teaches a dog or a puppy are “wait” and “this way”. 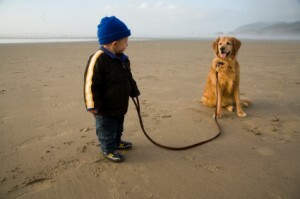 Using these two commands he can get a dog to go just about anywhere he needs them to and keep him safe along the way. The command “wait” is easy to teach your dog. For some reason, wait, feels temporary to a dog so he’s more willing to wait then to have to “stay” somewhere for a long time. “Wait” is good for street corners. Tell your dog to wait at the corner while traffic passes. Or maybe your dog needs to wait while another dog, kids, bike or whatever passes by. Maybe you want him to wait for his food. Whatever the reason, the dog learns that it is only a temporary situation, soon to be followed by the release (which is rewarding) and possibly more positive stimulation. The “this way” command is better than come. 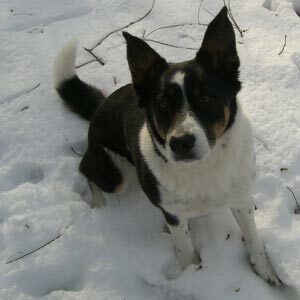 The recall or “come” command tends to get over used and dogs may get resentful after hearing it often. Using “this way” allows the dog to keep moving but in a different direction. If your dog is running away from you and doesn’t respond to the typical recall command of “come”, then try implementing “this way” into your training routine. A dog hears this as a chance to please and still keep moving. It’s much less restrictive to the dog and it’s really easy to teach this to a dog. For more effective communication with your dog, try dog training commands that teach your dog how to move with you without being too restrictive. Consider making “wait” and “this way” a primary part of your repertoire. The two dog training commands that make the most sense are ones that give you a lot of versatility with your dog. Get your dog or puppy moving where you want him using these two dog training commands. It stops pulling on the leash too. Listen in the free audio from my dog trainer John Spieser. 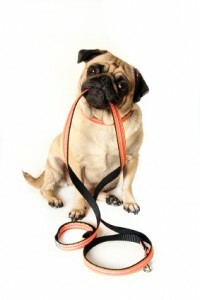 Is Dog Pulling on Leash a Problem for You? Does your dog pulling on the leash on walks frustrate you and make you wish you didn’t have to walk your dog? Did your dog come to you as an adult from a shelter? Then it is likely that you never had the chance to train the dog properly from the start, when he was a puppy. If you got your dog as a puppy and didn’t train him properly, it’s likely you never knew the right way to train your dog. Don’t worry. Old dogs can learn new tricks as long as you are willing to put the time in to train your dog the right way. A dog pulling on a leash should never be tolerated. Once you have let a dog pull on the leash you’ve effectively trained him that pulling is OK. So every time you are walking your dog and he’s pulling, you’re saying to the dog this is what I expect. And the bad behavior gets reinforced. Training a dog can be frustrating unless you have the right attitude. Patience is required. Standing in one spot and not moving forward while your dog pulls on the leash is perfectly acceptable. Don’t reward your dog by moving forward when your dog is doing something you don’t approve of. Keep a positive attitude and realize this is what is required right now. Once your dog learns how to walk without pulling on the leash your walks can resume. And you’ll be much happier. The sooner you don’t give in to your dog’s bad behavior, the sooner he will have no desire to keep it up. It won’t get him anywhere, he’ll figure out a new way to get what he wants, on your terms. Remember, dogs are smart. When walking a dog on a leash, any tension in the leash is a sign that you need to address the dog with either a command or correction or both, carefully timed. One difficulty with using a short leash is that you don’t have much time to give a verbal command before the dog reaches the end of a short leash. It’s no wonder that so many dogs pull on a leash. The owners don’t have time to correct them. Another reason dogs don’t get trained well is that when they are puppies, well meaning but uninformed adults let small children take the new puppy on a walk. With absolutely no dog training skills a kid basically drags a young puppy around on the leash teaching the dog that this is what it’s supposed to be like. There is always supposed to be tension on my neck. This is so unfair to the puppy. The puppy is getting nothing positive out of this experience and just ends up learning how to irritate its owners every time it goes for a much needed walk. One technique that is very useful in training a dog to walk on a leash is by using a long line. The long line dog training method allows you time to give a verbal correction or command to your dog before he reaches the end of the leash. This technique is extremely useful when you need to make changes to an adult dog’s behavior. An adult dog may run a lot faster than a puppy and get to the end of the leash or line quicker than a small puppy. 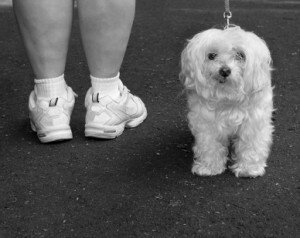 Training your dog properly to walk on a leash is something you need to do as a responsible pet owner. Dogs need to learn how to behave from humans if they want to survive in a human world. You can learn about the long line dog training method and stop your dog pulling on the leash. You and your dog will walk in harmony after you learn the simple method discussed in this free audio. There are probably as many dog training methods as there are dog trainers out in the world of dogs. Each dog trainer has a particular spin on dog training. Every dog trainer needs to motivate a dog in a way so that the dog behaves in a desired way. So dog training methods are based in motivation of the dog. What motivates you the most? Is it when someone yells at you? Maybe you really appreciate this if it happens infrequently and right before your about to hit by a bus! If someone yells at you all the time, chances are you’re going to tune it out or normalize it in your head. It just won’t matter, but it will still be pretty annoying. That’s how I’ve seen it with dogs. I have friends who (try to) motivate their dogs by yelling at them. No they SCREAM! at them. The dogs don’t care any more. They’ve learned to tune it out. I’m a proponent of sane living so I like it when I see a dog trainer talking peacefully to a dog. Seeing a dog responding to this kind of dog training method gives me hope for a saner world. You can talk to you dog in a normal voice and expect response. Sometimes you’ll need to increase your energy, but you know your dog will listen to you because that is something out of the ordinary and your dog is going to be surprised, if not curious. Getting your dog’s attention is a key part of the dog trainer’s dog training method. How you choose to communicate with your dog speaks volumes about your relationship with your dog.